very nicely presented quick guide to inscape which covers enough of the basics to get started, plus a few of the more interesting features. Draw another line in the region that will be filled. Select this line and the duplicate of the original. Fill it with a whatever color you want. The question was asked in the jabber room if it was possible to make a gradient follow a path. While strictly speaking its not, it is possible to fake it fairly well. This is a very quick and dirty outline of how…. Step 1. Create your path. Step 3. Connect the 2 curves – Duplicate the original again, Select both, do ctrl+K to make them into one path, then connect the nodes at either end so you have one shape. Step 4. Repeat the first 3 stages, but move the second line to where you want the far end of your gradient. put the relevant fills on the 2 shapes to be the start and end of the gradient, and remove the strokes. Step 5. 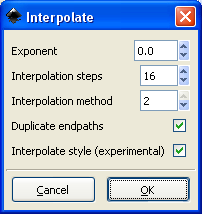 Use the interpolate effect to blend between them. Use method 2 and turn on blending of styles. Make sure the thin ones on top of the thick one.